The physical movement of image parts through simple mechanics – in for instance the moving images in magic lantern shows – can also be considered animation. The mechanical manipulation of puppets and objects to emulate living beings has a very long history in automata. Automata were popularised by Disney as animatronics. The word "animation" stems from the Latin "animationem" (nominative "animatio"), noun of action from past participle stem of "animare", meaning "the action of imparting life". The primary meaning of the English word is "liveliness" and has been in use much longer than the meaning of "moving image medium". The history of animation started long before the development of cinematography. Humans have probably attempted to depict motion as far back as the paleolithic period. 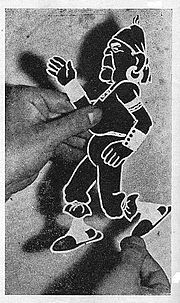 Shadow play and the magic lantern offered popular shows with moving images as the result of manipulation by hand and/or some minor mechanics. A 5,200-year old pottery bowl discovered in Shahr-e Sukhteh, Iran, has five sequential images painted around it that seem to show phases of a goat leaping up to nip at a tree. In 1833, the phenakistiscope introduced the stroboscopic principle of modern animation, which would also provide the basis for the zoetrope (1866), the flip book (1868), the praxinoscope (1877) and cinematography. 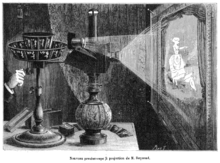 Charles-Émile Reynaud further developed his projection praxinoscope into the Théâtre Optique with transparent hand-painted colorful pictures in a long perforated strip wound between two spools, patented in December 1888. From 28 October 1892 to March 1900 Reynaud gave over 12,800 shows to a total of over 500.000 visitors at the Musée Grévin in Paris. His Pantomimes Lumineuses series of animated films each contained 300 to 700 frames that were manipulated back and forth to last 10 to 15 minutes per film. Piano music, song and some dialogue were performed live, while some sound effects were synchronized with an electromagnet. When film became a common medium some manufacturers of optical toys adapted small magic lanterns into toy film projectors for short loops of film. By 1902, they were producing many chromolithography film loops, usually by tracing live-action film footage (much like the later rotoscoping technique). Some early filmmakers, including J. Stuart Blackton, Arthur Melbourne-Cooper, Segundo de Chomón and Edwin S. Porter experimented with stop-motion animation, possibly since around 1899. Blackton's The Haunted Hotel (1907) was the first huge success that baffled audiences with objects apparently moving by themselves and inspired other filmmakers to try the technique for themselves. J. Stuart Blackton also experimented with animation drawn on blackboards and some cutout animation in Humorous Phases of Funny Faces (1906). In 1908, Émile Cohl's Fantasmagorie was released with a white-on-black chalkline look created with negative prints from black ink drawings on white paper. The film largely consists of a stick figure moving about and encountering all kinds of morphing objects, including a wine bottle that transforms into a flower. Inspired by Émile Cohl's stop-motion film Les allumettes animées [Animated Matches] (1908), Ladislas Starevich started making his influential puppet animations in 1910. Winsor McCay's Little Nemo (1911) showcased very detailed drawings. His Gertie the Dinosaur (1914) was also an early example of character development in drawn animation. During the 1910s, the production of animated short films typically referred to as "cartoons", became an industry of its own and cartoon shorts were produced for showing in movie theaters. The most successful producer at the time was John Randolph Bray, who, along with animator Earl Hurd, patented the cel animation process that dominated the animation industry for the rest of the decade. In 1919, the silent animated short Feline Follies was released, marking the debut of Felix the Cat, being the first animated character in the silent film era to win a high level of popularity. The earliest extant feature-length animated film is The Adventures of Prince Achmed (1926) made by director Lotte Reiniger and her collaborators Carl Koch and Berthold Bartosch. The first animation with full sound synchronization (both music and dialogue) was a short by Walt Disney’s animation studio called Steamboat Willie, featuring Mickey Mouse in 1928. In 1932, the first short animated film created entirely with Technicolor (using red/green/blue photographic filters and three strips of film in the camera) was Disney's Flowers and Trees, directed by Burt Gillett. The first full-color animated feature film was "Snow White and the Seven Dwarfs", also by Walt Disney. Through the 1930s and 1950s, the golden age of American animation saw new animated characters emerge, including Goofy, Donald Duck, Daisy Duck, Bugs Bunny, Daffy Duck, Porky Pig, Betty Boop, Popeye, Sylvester the Cat, Woody Woodpecker, Tweety, Wile E. Coyote and Road Runner, Elmer Fudd, Foghorn Leghorn, Yosemite Sam, Hunky and Spunky, Droopy, Little Audrey, Tom and Jerry, Barney Bear, Mr. Magoo, Mighty Mouse, George and Junior, the Fox and the Crow and the animated adoption of Superman, Baby Huey, Casper the Friendly Ghost, Little Lulu, among others. In 1958, Hanna-Barbera released The Huckleberry Hound Show, the first half hour television program to feature only in animation. Terrytoons released Tom Terrific that same year. Television significantly decreased public attention to the animated shorts being shown in theaters. In 2008, the animation market was worth US$68.4 billion. Animation as an art and industry continues to thrive as of the mid-2010s because well-made animated projects can find audiences across borders and in all four quadrants. Animated feature-length films returned the highest gross margins (around 52%) of all film genres in the 2004–2013 timeframe. The traditional cel animation process became obsolete by the beginning of the 21st century. Today, animators' drawings and the backgrounds are either scanned into or drawn directly into a computer system. Various software programs are used to color the drawings and simulate camera movement and effects. The final animated piece is output to one of several delivery media, including traditional 35 mm film and newer media with digital video. The "look" of traditional cel animation is still preserved, and the character animators' work has remained essentially the same over the past 70 years. Some animation producers have used the term "tradigital" (a play on the words "traditional" and "digital") to describe cel animation that uses significant computer technology. Examples of traditionally animated feature films include Pinocchio (United States, 1940), Animal Farm (United Kingdom, 1954), Lucky and Zorba (Italy, 1998), and The Illusionist (British-French, 2010). Traditionally animated films produced with the aid of computer technology include The Lion King (US, 1994), The Prince of Egypt (US, 1998), Akira (Japan, 1988), Spirited Away (Japan, 2001), The Triplets of Belleville (France, 2003), and The Secret of Kells (Irish-French-Belgian, 2009). Full animation refers to the process of producing high-quality traditionally animated films that regularly use detailed drawings and plausible movement, having a smooth animation. Fully animated films can be made in a variety of styles, from more realistically animated works like those produced by the Walt Disney studio (The Little Mermaid, Beauty and the Beast, Aladdin, The Lion King) to the more 'cartoon' styles of the Warner Bros. animation studio. Many of the Disney animated features are examples of full animation, as are non-Disney works, The Secret of NIMH (US, 1982), The Iron Giant (US, 1999), and Nocturna (Spain, 2007). Fully animated films are animated at 24 frames per second, with a combination of animation on ones and twos, meaning that drawings can be held for one frame out of 24 or two frames out of 24. Rotoscoping is a technique patented by Max Fleischer in 1917 where animators trace live-action movement, frame by frame. The source film can be directly copied from actors' outlines into animated drawings, as in The Lord of the Rings (US, 1978), or used in a stylized and expressive manner, as in Waking Life (US, 2001) and A Scanner Darkly (US, 2006). Some other examples are Fire and Ice (US, 1983), Heavy Metal (1981), and Aku no Hana (2013). Live-action/animation is a technique combining hand-drawn characters into live action shots or live action actors into animated shots. One of the earlier uses was in Koko the Clown when Koko was drawn over live action footage. Other examples include Allegro Non Troppo (Italy, 1976), Who Framed Roger Rabbit (US, 1988), Space Jam (US, 1996) and Osmosis Jones (US, 2001). Stop-motion animation is used to describe animation created by physically manipulating real-world objects and photographing them one frame of film at a time to create the illusion of movement. There are many different types of stop-motion animation, usually named after the medium used to create the animation. Computer software is widely available to create this type of animation; traditional stop motion animation is usually less expensive but more time-consuming to produce than current computer animation. Puppetoon, created using techniques developed by George Pal, are puppet-animated films that typically use a different version of a puppet for different frames, rather than simply manipulating one existing puppet. Clay animation, or Plasticine animation (often called claymation, which, however, is a trademarked name), uses figures made of clay or a similar malleable material to create stop-motion animation. The figures may have an armature or wire frame inside, similar to the related puppet animation (below), that can be manipulated to pose the figures. Alternatively, the figures may be made entirely of clay, in the films of Bruce Bickford, where clay creatures morph into a variety of different shapes. 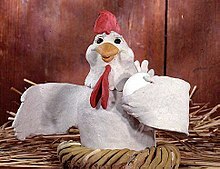 Examples of clay-animated works include The Gumby Show (US, 1957–1967), Mio Mao (Italy, 1974–2005), Morph shorts (UK, 1977–2000), Wallace and Gromit shorts (UK, as of 1989), Jan Švankmajer's Dimensions of Dialogue (Czechoslovakia, 1982), The Trap Door (UK, 1984). Films include Wallace & Gromit: The Curse of the Were-Rabbit, Chicken Run and The Adventures of Mark Twain. Model animation refers to stop-motion animation created to interact with and exist as a part of a live-action world. Intercutting, matte effects and split screens are often employed to blend stop-motion characters or objects with live actors and settings. Examples include the work of Ray Harryhausen, as seen in films, Jason and the Argonauts (1963), and the work of Willis H. O'Brien on films, King Kong (1933). Go motion is a variant of model animation that uses various techniques to create motion blur between frames of film, which is not present in traditional stop-motion. The technique was invented by Industrial Light & Magic and Phil Tippett to create special effect scenes for the film The Empire Strikes Back (1980). Another example is the dragon named "Vermithrax" from Dragonslayer (1981 film). Pixilation involves the use of live humans as stop motion characters. This allows for a number of surreal effects, including disappearances and reappearances, allowing people to appear to slide across the ground, and other effects. Examples of pixilation include The Secret Adventures of Tom Thumb and Angry Kid shorts, and the academy award-winning Neighbours by Norman McLaren. 2D animation figures are created or edited on the computer using 2D bitmap graphics and 2D vector graphics. This includes automated computerized versions of traditional animation techniques, interpolated morphing, onion skinning and interpolated rotoscoping. 2D animation has many applications, including analog computer animation, Flash animation, and PowerPoint animation. Cinemagraphs are still photographs in the form of an animated GIF file of which part is animated. Machinima – Films created by screen capturing in video games and virtual worlds. The term originated from the software introduction in the 1980s demoscene, as well as the 1990s recordings of the first-person shooter video game Quake. Physically based animation is animation using computer simulations. Animatronics is the use of mechatronics to create machines that seem animate rather than robotic. Linear Animation Generator is a form of animation by using static picture frames installed in a tunnel or a shaft. The animation illusion is created by putting the viewer in a linear motion, parallel to the installed picture frames. The concept and the technical solution were invented in 2007 by Mihai Girlovan in Romania. The magic lantern used mechanical slides to project moving images, probably since Christiaan Huygens invented this early image projector in 1659. An animator is an artist who creates a visual sequence (or audio-visual if added sound) of multiple sequential images that generate the illusion of movement, that is, an animation. Animations are currently in many areas of technology and video, such as cinema, television, video games or the internet. Generally, these works require the collaboration of several animators. The methods to create these images depend on the animator and style that one wants to achieve (with images generated by computer, manually ...). Animators can be divided into animators of characters (artists who are specialized in the movements, dialogue and acting of the characters) and animators of special effects (for example vehicles, machinery or natural phenomena such as water, snow, rain). The creation of non-trivial animation works (i.e., longer than a few seconds) has developed as a form of filmmaking, with certain unique aspects. Traits common to both live-action and animated feature-length films are labor-intensity and high production costs. The most important difference is that once a film is in the production phase, the marginal cost of one more shot is higher for animated films than live-action films. It is relatively easy for a director to ask for one more take during principal photography of a live-action film, but every take on an animated film must be manually rendered by animators (although the task of rendering slightly different takes has been made less tedious by modern computer animation). It is pointless for a studio to pay the salaries of dozens of animators to spend weeks creating a visually dazzling five-minute scene if that scene fails to effectively advance the plot of the film. Thus, animation studios starting with Disney began the practice in the 1930s of maintaining story departments where storyboard artists develop every single scene through storyboards, then handing the film over to the animators only after the production team is satisfied that all the scenes make sense as a whole. While live-action films are now also storyboarded, they enjoy more latitude to depart from storyboards (i.e., real-time improvisation). Another problem unique to animation is the requirement to maintain a film's consistency from start to finish, even as films have grown longer and teams have grown larger. Animators, like all artists, necessarily have individual styles, but must subordinate their individuality in a consistent way to whatever style is employed on a particular film. Since the early 1980s, teams of about 500 to 600 people, of whom 50 to 70 are animators, typically have created feature-length animated films. It is relatively easy for two or three artists to match their styles; synchronizing those of dozens of artists is more difficult. Criticism of animation has been common in media and cinema since its inception. With its popularity, a large amount of criticism has arisen, especially animated feature-length films. Many concerns of cultural representation, psychological effects on children have been brought up around the animation industry, which has remained rather politically unchanged and stagnant since its inception into mainstream culture. Several other countries have instituted an award for best-animated feature film as part of their national film awards: Africa Movie Academy Award for Best Animation (since 2008), BAFTA Award for Best Animated Film (since 2006), César Award for Best Animated Film (since 2011), Golden Rooster Award for Best Animation (since 1981), Goya Award for Best Animated Film (since 1989), Japan Academy Prize for Animation of the Year (since 2007), National Film Award for Best Animated Film (since 2006). Also since 2007, the Asia Pacific Screen Award for Best Animated Feature Film has been awarded at the Asia Pacific Screen Awards. Since 2009, the European Film Awards have awarded the European Film Award for Best Animated Film. ^ Buchan, Suzanne (22 August 2013). "Pervasive Animation". Routledge – via Google Books. ^ "The definition of animation". ^ Cohn, Neil (15 February 2006). "The Visual Linguist: Burnt City animation VL". The Visual Linguist. ^ Ball, Ryan (12 March 2008). "Oldest Animation Discovered In Iran". Animation Magazine. ^ Crafton 1993, pp. 60–61. ^ Canemaker 2005, p. 171. ^ Solomon 1989, p. 28. ^ Solomon 1989, p. 24. ^ Solomon 1989, p. 34. ^ Bendazzi 1994, p. 49. ^ Crafton 1993, p. 378. ^ Beckerman 2003, p. 25. ^ a b Bendazzi 1994, pp. 234–35. ^ Beckerman 2003, p. 61. ^ Solomon 1989, pp. 239–40. ^ Masson 2007, p. 432. ^ Board of Investments 2009. ^ White 2006, p. 31. ^ Beckerman 2003, p. 153. ^ Thomas & Johnston 1981, pp. 277–79. ^ Laybourne 1998, p. 203. ^ White 2006, pp. 195–201. ^ a b Buchan 2013. ^ White 2006, p. 394. ^ a b Culhane 1990, p. 296. ^ Laybourne 1998, pp. 35–36, 52–53. ^ a b Williams 2001, pp. 52–57. ^ Solomon 1989, pp. 63–65. ^ Beckerman 2003, p. 80. ^ Culhane 1990, p. 71. ^ Culhane 1990, pp. 194–95. ^ Laybourne 1998, pp. 25–26. ^ Beckerman 2003, p. 142. ^ Beckerman 2003, pp. 54–55. ^ Ledoux 1997, p. 24, 29. ^ Lawson & Persons 2004, p. 82. ^ Solomon 1989, p. 241. ^ Lawson & Persons 2004, p. xxi. ^ Crafton 1993, p. 158. ^ Laybourne 1998, pp. 163–64. ^ Laybourne 1998, pp. 162–63. ^ Beck 2004, pp. 18–19. ^ a b Solomon 1989, p. 299. ^ a b Laybourne 1998, p. 159. ^ Solomon 1989, p. 171. ^ Laybourne 1998, pp. 155–56. ^ Beck 2004, p. 70. ^ Beck 2004, pp. 92–93. ^ Laybourne 1998, pp. 150–151. ^ Laybourne 1998, pp. 151–54. ^ Beck 2004, p. 250. ^ Furniss 1998, pp. 52–54. ^ Laybourne 1998, pp. 59–60. ^ Culhane 1990, pp. 170–171. ^ Harryhausen & Dalton 2008, pp. 9–11. ^ Smith 1986, p. 90. ^ Smith 1986, pp. 91–95. ^ Laybourne 1998, pp. 51–57. ^ Laybourne 1998, p. 128. ^ Paul 2005, pp. 357–63. ^ a b Laybourne 1998, pp. 75–79. ^ Masson 2007, p. 405. ^ Serenko 2007, p. 482. ^ Masson 2007, p. 165. ^ Sito 2013, pp. 32, 70, 132. ^ Priebe 2006, pp. 71–72. ^ White 2006, p. 392. ^ Lowe & Schnotz 2008, pp. 246–47. ^ Masson 2007, pp. 127–28. ^ a b Masson 2007, p. 88. ^ Sito 2013, p. 208. ^ Masson 2007, pp. 78–80. ^ Sito 2013, p. 285. ^ Masson 2007, p. 96. ^ Lowe & Schnotz 2008, p. 92. ^ "Cel Shading: the Unsung Hero of Animation?". Animator Mag. 17 December 2011. Archived from the original on 5 March 2016. Retrieved 20 February 2016. ^ Sito 2013, pp. 207–08. ^ Masson 2007, p. 204. ^ Parent 2007, p. 19. ^ Donald H. House; John C. Keyser (30 November 2016). Foundations of Physically Based Modeling and Animation. CRC Press. ISBN 978-1-315-35581-8. ^ Pilling 1997, p. 249. ^ Parent 2007, pp. 22–23. ^ Faber & Walters 2004, p. 1979. ^ Pilling 1997, p. 222. ^ Pilling 1997, p. 204. ^ Brown 2003, p. 7. ^ Furniss 1998, pp. 30–33. ^ a b Laybourne 1998, pp. 22–24. ^ Solomon 1989, pp. 8–10. ^ Laybourne 1998, p. xiv. ^ White 2006, p. 203. ^ Laybourne 1998, p. 117. ^ Solomon 1989, p. 274. ^ White 2006, p. 151. ^ Culhane 1990, p. 55. ^ Solomon 1989, p. 120. ^ Laybourne 1998, pp. 100–01. ^ Masson 2007, p. 94. ^ Beck 2004, p. 37. ^ a b Williams 2001, p. 34. ^ Culhane 1990, p. 146. ^ Laybourne 1998, pp. 99–100. ^ Walt Disney Family Museum 2013. ^ Beckerman 2003, p. 37. ^ Shaffer 2010, p. 211. ^ Beckerman 2003, pp. 84–85. Baer, Eva (1983). Metalwork in Medieval Islamic Art. State University of New York Press. pp. 58, 86, 143, 151, 176, 201, 226, 243, 292, 304. ISBN 978-0-87395-602-4. Beckerman, Howard (2003). Animation: The Whole Story. Allworth Press. ISBN 978-1-58115-301-9. Buchan, Suzanne (2013). Pervasive Animation. New York and London: Routledge. ISBN 978-0-415-80723-4. Crafton, Donald (1993). Before Mickey: The Animated Film 1898–1928. Chicago: University of Chicago Press. ISBN 978-0-226-11667-9. Culhane, Shamus (1990). Animation: Script to Screen. St. Martin's Press. ISBN 978-0-312-05052-8. Drazin, Charles (2011). The Faber Book of French Cinema. Faber & Faber. ISBN 978-0-571-21849-3. Finkielman, Jorge (2004). The Film Industry in Argentina: An Illustrated Cultural History. North Carolina: McFarland. p. 20. ISBN 978-0-7864-1628-8. Furniss, Maureen (1998). Art in Motion: Animation Aesthetics. Indiana University Press. ISBN 978-1-86462-039-9. Faber, Liz; Walters, Helen (2004). Animation Unlimited: Innovative Short Films Since 1940. London: Laurence King Publishing. ISBN 978-1-85669-346-2. Laybourne, Kit (1998). The Animation Book: A Complete Guide to Animated Filmmaking – from Flip-books to Sound Cartoons to 3-D Animation. New York: Three Rivers Press. ISBN 978-0-517-88602-1. Lawson, Tim; Persons, Alisa (2004). The Magic Behind the Voices [A Who's Who of Cartoon Voice Actors]. University Press of Mississippi. ISBN 978-1-57806-696-4. Ledoux, Trish (1997). Complete Anime Guide: Japanese Animation Film Directory and Resource Guide. Tiger Mountain Press. ISBN 978-0-9649542-5-0. Lowe, Richard; Schnotz, Wolfgang, eds. (2008). Learning with Animation. Research implications for design. New York: Cambridge University Press. ISBN 978-0-521-85189-3. Parent, Rick (2007). Computer Animation: Algorithms & Techniques. Ohio State University: Morgan Kaufmann. ISBN 978-0-12-532000-9. Paul, Joshua (2005). Digital Video Hacks. O'Reilly Media. ISBN 978-0-596-00946-5. Pilling, Jayne (1997). Society of Animation Studies (ed.). A Reader in Animation Studies. Indiana University Press. ISBN 978-1-86462-000-9. Priebe, Ken A. (2006). The Art of Stop-Motion Animation. Thompson Course Technology. ISBN 978-1-59863-244-6. Serenko, Alexander (2007). "Computers in Human Behavior" (PDF). The Development of an Instrument to Measure the Degree of Animation Predisposition of Agent Users. 23 (1): 478–95. Shaffer, Joshua C. (2010). Discovering The Magic Kingdom: An Unofficial Disneyland Vacation Guide. Indiana: Author House. ISBN 978-1-4520-6312-6. Thomas, Bob (1958). Walt Disney, the Art of Animation: The Story of the Disney Studio Contribution to a New Art. Walt Disney Studios. Simon and Schuster. Thomas, Frank; Johnston, Ollie (1981). Disney Animation: The Illusion of Life. Abbeville Press. ISBN 978-0-89659-233-9. Zielinski, Siegfried (1999). Audiovisions: Cinema and Television as Entr'actes in History. Amsterdam University Press. ISBN 978-90-5356-303-8. Smith, Thomas G. (1986). Industrial Light & Magic: The Art of Special Effects. New York: Ballantine Books. ISBN 978-0-345-32263-0. Ball, Ryan (12 March 2008). "Oldest Animation Discovered In Iran". Animation Magazine. Retrieved 15 March 2016. Beck, Jerry (2 July 2012). "A Little More About Disney's "Paperman"". Cartoon Brew. Bendazzi, Giannalberto (1996). "The Untold Story of Argentina's Pioneer Animator". Animation World Network. Retrieved 29 April 2016. "Animation" (PDF). boi.gov.ph. Board of Investments. November 2009. Archived from the original (PDF) on 19 October 2012. Retrieved 24 July 2012. Brown, Margery (2003). "Experimental Animation Techniques" (PDF). Olympia, Washington: Evergreen State Collage. Archived from the original (PDF) on 7 March 2008. Retrieved 11 November 2005. Carbone, Ken (24 February 2010). "Stone-Age Animation in a Digital World: William Kentridge at MoMA". Fast Company. Retrieved 7 March 2016. "World's Oldest Animation?". theheritagetrust.wordpress.com. The Heritage Trust. 25 July 2012. Archived from the original on 22 October 2015. Kenyon, Heather (1 February 1998). "How'd They Do That? : Stop-Motion Secrets Revealed". Animation World Network. Retrieved 2 March 2016. Nagel, Jan (21 May 2008). "Gender in Media: Females Don't Rule". Animation World Network. Retrieved 3 March 2016. McDuling, John (3 July 2014). "Hollywood Is Giving Up on Comedy". The Atlantic. The Atlantic Monthly Group. Retrieved 20 July 2014. McLaughlin, Dan (2001). "A Rather Incomplete But Still Fascinating". Film Tv. UCLA. Archived from the original on 19 November 2009. Retrieved 12 February 2013. O'Keefe, Matt (11 November 2014). "6 Major Innovations That Sprung from the Heads of Disney Imagineers". Theme Park Tourist. Retrieved 9 March 2016. Watercutter, Angela (24 May 2012). "35 Years After Star Wars, Effects Whiz Phil Tippett Is Slowly Crafting a Mad God". Wired. Retrieved 6 February 2016. Zohn, Patricia (28 February 2010). "Coloring the Kingdom". Vanity Fair. Retrieved 7 December 2015. "Walt Disney's Oscars". The Walt Disney Family Museum. 22 February 2013. Archived from the original on 22 March 2015. Retrieved 22 February 2016. "Władysław Starewicz – Biography". culture.pl. Adam Mickiewicz Institute. 16 April 2012. Retrieved 9 February 2016. Bibliography on animation – Websiite "Histoire de la télévision"